The original Wade tree has become a mainstay of the slick fork trees. Coming from the Oregon cow country it has been copied many times over. Our McCall version is true to the traditional Wade style. Our McCall style bars fit the horse tremendously well. One of our most popular styles. Its easy to see why. Northwest Wade with integral laminated hardwood wood post horn. Rawhide cover with rawhide lace. 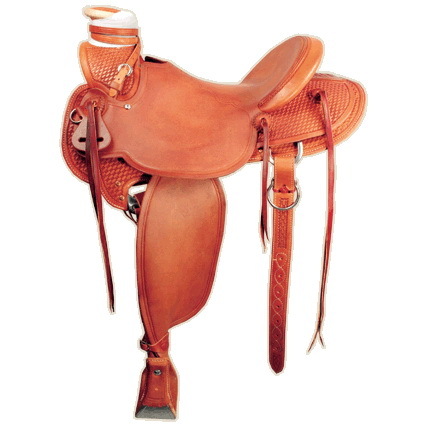 8″ high by 6¼” wide SQH or modified QH standard (regular (narrower). QH and FQH available). 3″ high by 4½” finished cap size round. 4″ by 12″ round (higher and wider available). Standard 7/8 Hamley flat plate with brass or stainless steel rear flanged dee – any rigging style available. 4″ bell lined and half covered – standard. 3″ full standard – any style available.